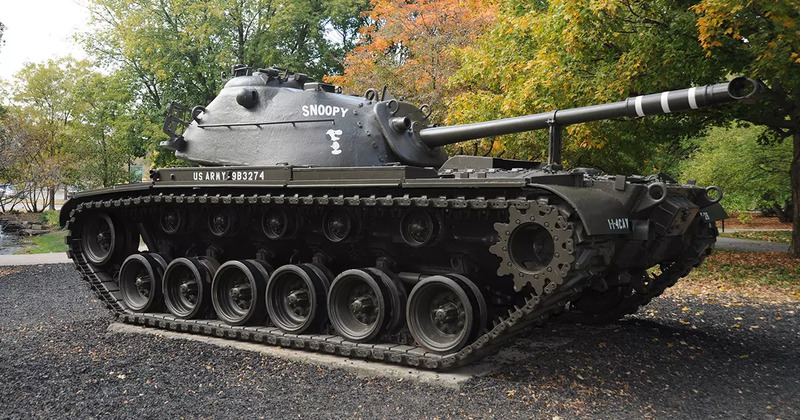 The M48 Patton was developed during the Cold War to replace the M47 as the US Army’s main battle tank. It went through several modifications aimed at improving its reliability in the field. The M48 served with the US and NATO countries in Europe, and the US Army and Marine Corps in Vietnam. While it looked similar to the M46 and M47, it was a completely redesigned tank with a new hull, turret and improved suspension. A drawback to the early M48 was its gasoline engine which yielded a short range of 70 miles to 200 gallons of fuel and made the tank more vulnerable to catastrophic fires and explosions. The M48A3 and later models switched to diesel, making them safer and more efficient. The 1st Infantry Division used the M48A3 in Vietnam in a variety of roles which included clearing roads to ensure safe communication routes and protecting troop and supply convoys. Later models served until the 1980s.